What’s the best way to keep babies happy? With a rattle of course! For hundreds of years, rattles have been a favorite among growing babies, who will shake, bite, and throw them around. Today’s baby rattles are nothing like what we had in the past. We got by with simple balls attached to a handle that made such a ruckus, our parents regretted buying them. Well, today’s rattles are nothing like that, and we’re going to be looking at some of the best baby rattles on the market. Will You Take This Ring? Use the links above to check the latest prices or read our in-depth baby rattle reviews below. Rattles do more than keep the baby happy when mom is busy with other things. Grabbing and shaking the rattle will help enhance your baby’s gross motor skills. Your baby will discover cause and effect as they play with a rattle. They’ll understand that whenever they shake that colorful object, it makes a sound (source). You can help develop your baby’s hand-eye coordination by shaking the rattle and moving it across their field of vision. Your child will follow it around and in no time be reaching out to take it. Your baby’s age is a key consideration. Soft and lightweight rattles are better for babies younger than 3 months. Older babies with better motor skills will appreciate an interactive rattle, with buttons they can press. Similarly, a teething baby will be happy to play with rattles that double up as teethers. As with any other toy, a rattle will no doubt find its way into your baby’s mouth. Ensure that the toy you buy is safe and toxin-free. Ever seen a funny video where a baby hurts himself with a rattle that’s too big for him? It’s funny to the people in the video, but the baby could easily get hurt by a toy that’s too big, heavy, or hard. Different materials are used to make rattles, including plastic, fabric, rubber, and wood. Go for a rattle made from materials that can withstand constant use and are easy to clean. How can you be sure that the cute rattle you choose is the best? We’ve taken the guesswork out of your shopping, by sharing our choice of the best baby rattles we could find on the market. Mortimer has got to be the most endearing rattle ever and there’s plenty here for your baby to enjoy. He comes with high-contrast knotted hooves, a squeaker tummy, and antlers that are perfect for teething. 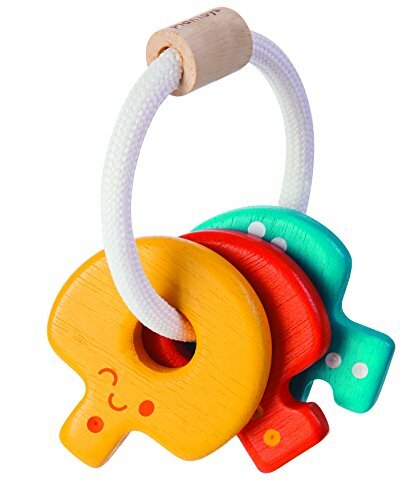 The clickety clackety tail rings are designed to amuse and entertain your baby. When your little one is finally ready to sleep, the super soft body is perfect for snuggling. This happy little fella will put a smile on your baby’s face. 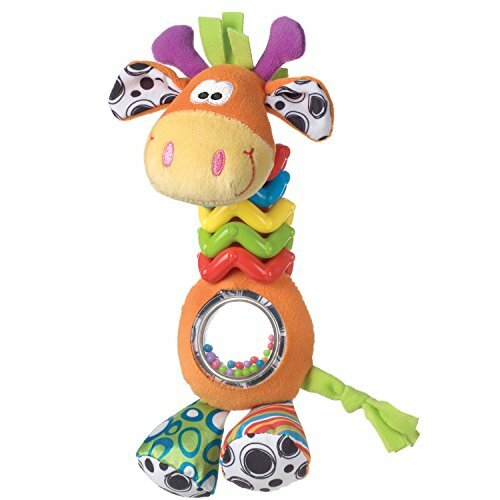 The rattling giraffe has multiple textures, all designed to awaken a child’s curiosity and senses. 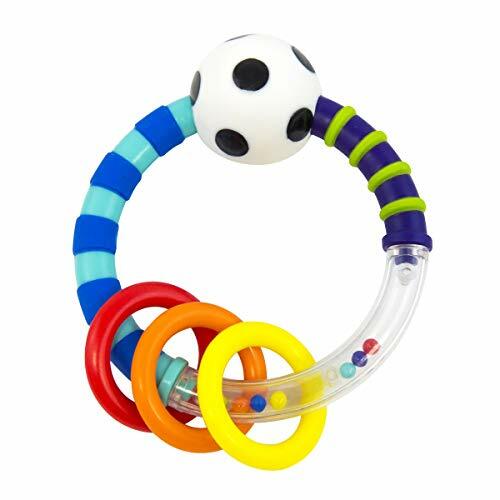 With click-clack rings around his neck and rattling balls in his bell, he’s sure to keep your baby busy. Your baby will also discover that bead buddy’s feet produce a crinkling sound when squished. Don’t be surprised if the little guy is banged on the floor several times. He’s making baby music. 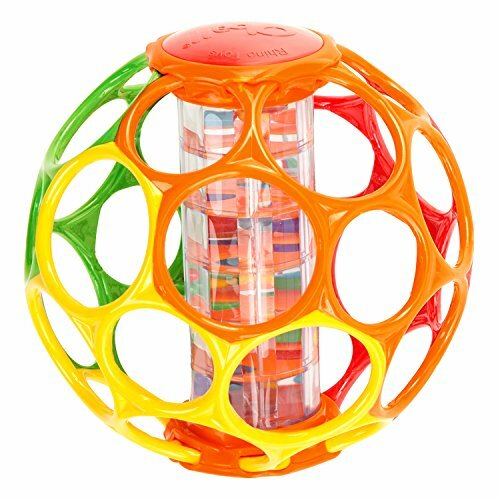 This award-winning toy features several soft tubes that are interlocked in a maze-like fashion. There’s a cube in the middle that produces a pleasant rattling sound when shaken. Its bright colors are designed to appeal to your little one, who will have no problem clutching onto it. It’s ideal for babies ages 0 to 2 years. Teething babies, in particular, will love sinking their gums into the tubes, which are BPA-free. This brightly-colored rattle is just right for very young babies, who love clutching their parent’s hands. Its multi-textured surface will feel soft against your baby’s skin and in their hands. It’s also safe for your baby to chew on. The colors and high contrast patterns are great for reinforcing visual tracking as you move it across their field of vision. You can also attach it to a play mat or car seat, allowing your baby to enjoy it anywhere. 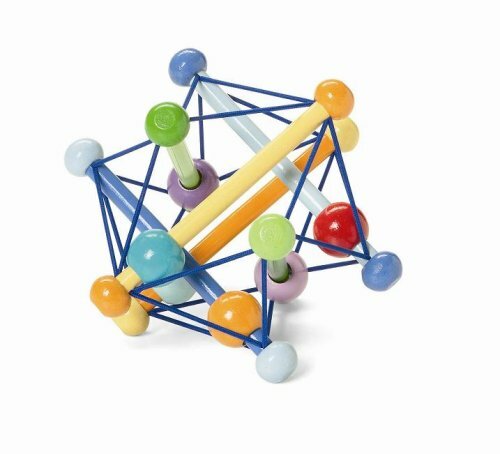 Your baby is definitely not ready for geometry class, but they’ll love this uniquely shaped toy. It features colorful rattling beads that slide along wooden dowels, which are strung together using elastic ties. This rattle encourages two-handed play and is suitable for babies of all ages. Your baby will love squishing down this rattle and watching it spring back to its original shape. With one sassy ring, you get three amazing benefits. The contrasting polka dots, stripes, and colors will capture your baby’s attention and help develop their visual and motor skills. Multiple textures around the rattle are great for teething and enhancing your baby’s tactile sensitivity. Suitable for newborns and older babies, this is clearly one ring you’ll want your baby to have. This baby-sized set of two is ideal for babies ages 3 months and above. The topside of the maracas is made of soft fabric, while the rest of the toy comes in smooth plastic. These textural differences, coupled with the soft sounding beads, will help expand your baby’s sensory knowledge. Let’s not forget the sweet sound maracas are so famously known for. Your baby will be making their own beats in no time. This rattle features two clear spheres, containing a mirror and colorful beads, and a textured handle for a great grip. Your child’s curiosity will be aroused as they watch the light, listen to the sounds, and feel the different textures. It’s lightweight, easy to clean, and ideal for babies of all ages. Parents will love being able to slip it into the diaper bag before heading out. 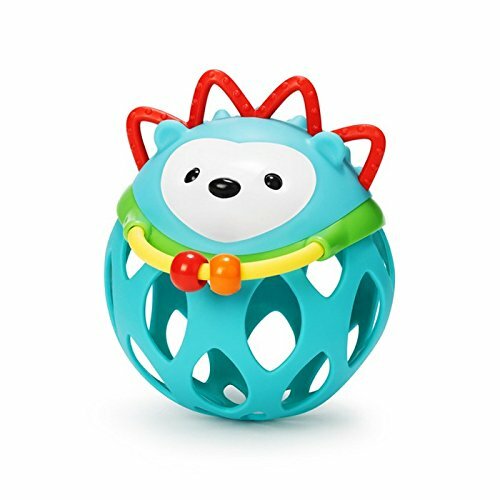 This toy is great for little ones in need of a teether or who want entertaining. It features a ball with holes, plus a rainstick in the middle. As your child turns the rattle, the beads cascade, mimicking the soothing sound of raindrops. 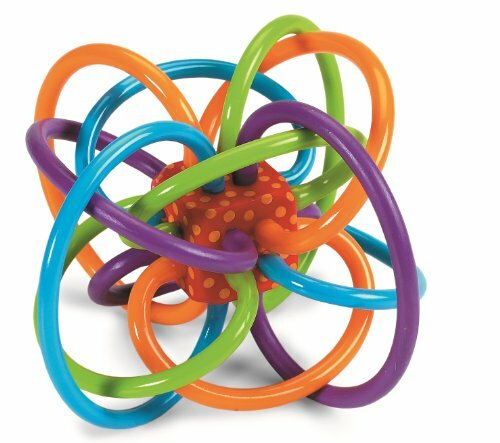 Recommended for babies ages 3 months and above, this rattle’s colorful appearance will hold your child’s interest for a long time. They can beat on it like a drum, shake it, roll it or put it in their mouths. This adorable hedgehog is a must-have for babies over 3 months old. It features rubberized details that are safe for teething or chewing. The large holes offer an easy grip, while its head has a different texture, to pique your baby’s interest. Babies who are starting to crawl will love playing with it since it’s designed to encourage movement. As it rolls over, its cute face (if nothing else) will invite your little one to reach for it. 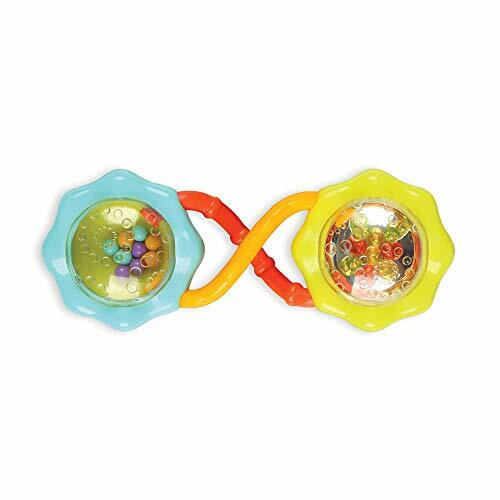 This toy is made up of two mesh-like balls, attached to either side of a textured handle. 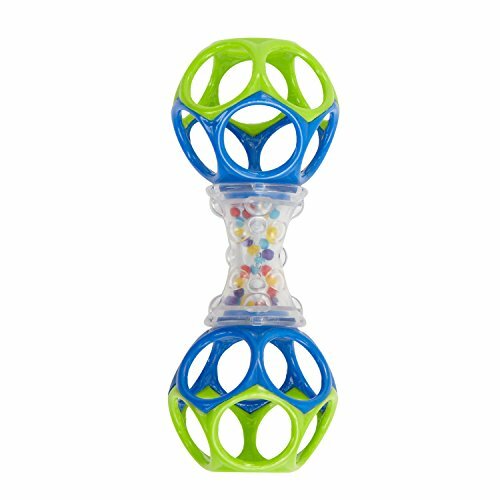 The clear handle holds several brightly-colored balls that your child will love shaking and watching. 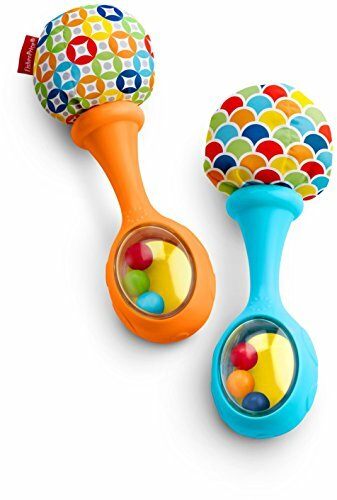 The balls are great for teething and are made to suit tiny fingers, making them easy to grab, bite, or shake away. It’s one of those wipe-me-down types that will be a favorite in your home. This delightful set of keys is made from high quality, sustainable rubber wood, and is coated with non-toxic finishes. The vibrant colors are derived from vegetable dyes and the keys are connected using a ring of rope. This toy is ideal for babies ages 4 months and over. It’s safe for teething and promoting visual and gross motor skills. Next time the baby is going out of the house, why not let them carry their own set of keys? This cute monkey and elephant set features two wrist rattles and two socks fitted with bells and rustled paper. They’re great for enhancing visual and auditory skills and introducing the concept of cause and effect to your baby. Every time they wriggle, something happens. Your baby will enjoy waving their arms or wiggling around, which will help promote their gross motor skills. Plus, older children will be able to identify the animals from their favorite books or cartoons. If you’re like me, you’ll want to take all of these rattle toys home. 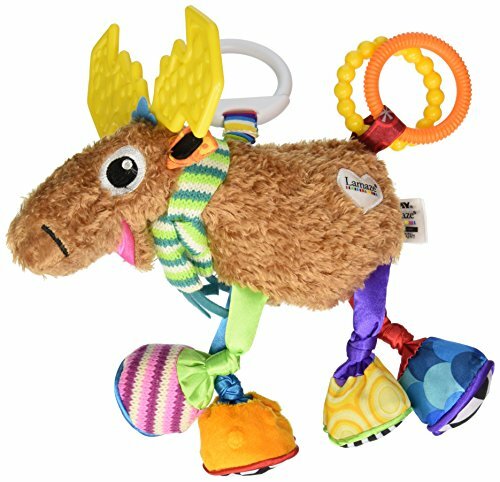 If I had to choose one, though, it would be the Lamaze Mortimer the Moose. This toy offers the ultimate experience for a baby. From amusement to visual appeal, auditory enhancement, teething, and snuggling. Play is no fun if it doesn’t help your baby grow in one way or the other. 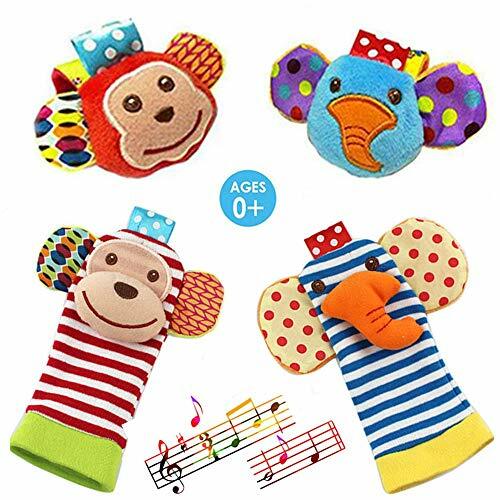 The best baby rattles are made from quality materials, they entertain, and they aid in cognitive development to boot. What’s your favorite baby rattle? Let us know in the comments, and remember to click the share button while you are at it.